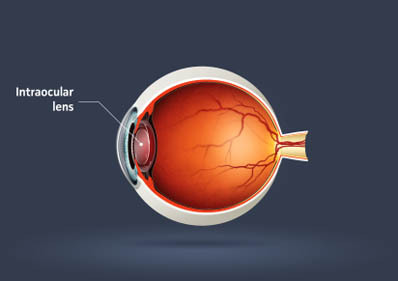 Within the anterior chamber there is a lens that changes shape to add magnification to see things up close. This crystalline lens is structured like an onion, having a central nucleus that is surrounded by layers, and the whole body is held within a capsule. The capsule is suspended by zonules, that on straight gaze are connected to a radial muscle that pulls tightly compressing the lens. In a process known as accommodation, that muscle relaxes, the capsule slackens, and the lens naturally bulges, increasing magnification, allowing you to read comfortably. Throughout a lifetime, new layers are generated and added to the outside of the lens. As the center becomes more separated from its nutrients by these layers, it begins to harden and discolor as a cataract forms. This discoloration leads to cloudiness and eventually to an opacity. It is then considered a cataract. A cataract only becomes a surgical issue when it interferes with clear vision. When a patient becomes insecure with their vision, the lens can come out. Surgical intervention is the only effective method to treat cataracts. 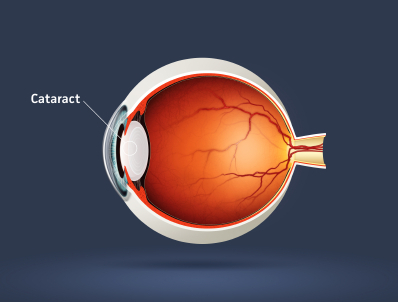 The opacified lens is removed and a plastic intra-ocular lens (IOL) is put in its place. This is one of the most common surgical procedures performed in this country. It incorporates a local anesthesia, and the patient usually returns home on the same day with functional vision with a full post-operative recovery within a few months. With cataract surgery the natural lens is removed and replaced with an implant restoring vision miraculously, literally overnight.